Click on thumbnail to view entire photo. 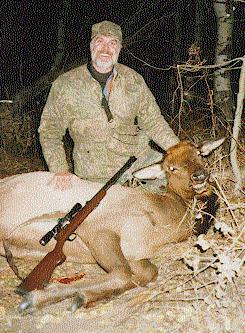 Bill was in Utah on a Cow Moose tag testing the new "LBT - Alloy" bullet. 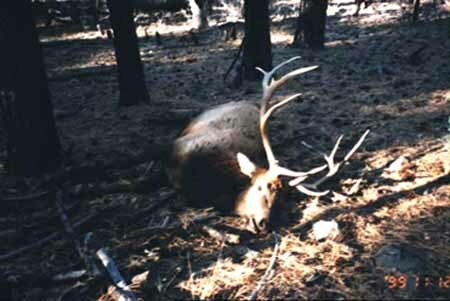 The cow was broadside at 97 yards. The bullet broke both shoulders and destroyed both lungs while exiting the opposite side. The Moose was down inside 30 yards. Good shot Bill! "...the bullet expanded to .930" with a retained weight of 364 grains...the elk was down in 10-12 yards...the bullet did an excellent job ...completely destroyed both lungs...bullet was recovered just under the hide on the far side after clipping a rib"
Nice Elk, Gene. Glad we could help. Good job Bob! The first harvest with the .40 QT. 97 yard shot - zero yards to recovery. 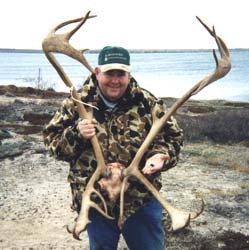 Great hunt in spite of the plane burning, leaking pontoon etc..
Dave writes "I used one of your fine Extreme 360's to bag this nice 6x6 Elk in Arizona in November of 1999. It was a slightly downhill, frontal shot at about 80 yards. He was down before I recovered from the recoil and the smoke had cleared! The bullet entered through the neck/shoulder, traveled through the Heart/lung, and was found well into the entrails. Estimated penetration is at least 30". I am totally impressed, as was my hunting partner. He was using 240 gr Hornady XTP sabots. 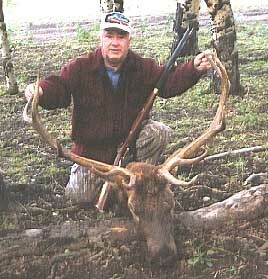 He also bagged a 6x6, but only after it ran 400 yards! By the way he had a perfect broadside shot, which was also well placed at less than 60 yards. I also appreciate all the help you have been on the phone during orders. Precision Bullets are the way to go!"